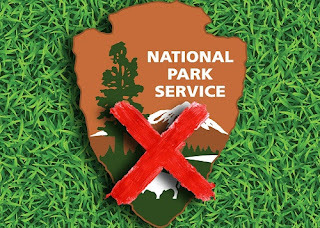 The advisory board that consults with the Interior Department on issues regarding the National Park Service resigned en masse over the past week, realizing too late that Interior Secretary Ryan Zinke has no interest in national parks or service. All but two members of the board quit because they didn't feel like they were being heard. Quite the opposite; they felt completely ignored when they made a good-faith effort to offer advice. Zinke was expected to be a friend of national parks, having come from the West and all that, but he has been too busy reducing national monuments and catering to corporate interests. The complaint against Zinke was that he "showed no interest in learning about or continuing to use the forward-thinking agenda of science, the effect of climate change, protections of the ecosystems, [or] education." As if this weren't all bad enough, park fees are going up, meaning that our parks are not only going to pot, we have to pay more to use them. Not that a lot of us actually go to them. On MSNBC, Stephanie Ruhle said that the fee hike was most unfortunate, noting that a lot of families love to travel to national parks every summer. What is this, 1957? Fathers don't load up the station wagons and take their families to national parks on long vacations anymore, mainly because there are fewer fathers, no station wagons, and no long vacations. We have single moms forgoing vacation days at work to make the payments on their SUVs, knowing that they can be replaced if they take even one vacation day - which could cause them to miss their deadlines. You go to national parks, you're likely to see more foreigners there. Well, at least you were, until January 2017. Speaking of which, Ruhle also praised national parks as an attractive alternative to European vacations, which most Americans, like I, have neither the time nor the money for. Yeah, well, I can't afford to go to national parks either. I'm just glad I went to Acadia National Park outside Bar Harbor, Maine when I did . . . twenty years ago. And something tells me that Acadia is going to deteriorate and be abandoned . . . kind of like the Bar Harbor sweatshirt I bought when I was there.